This post is sponsored by NEUTROGENA®. I only recommend products I use personally and believe my followers will also enjoy! Some of the products mentioned were provided by NEUTROGENA® for this post. 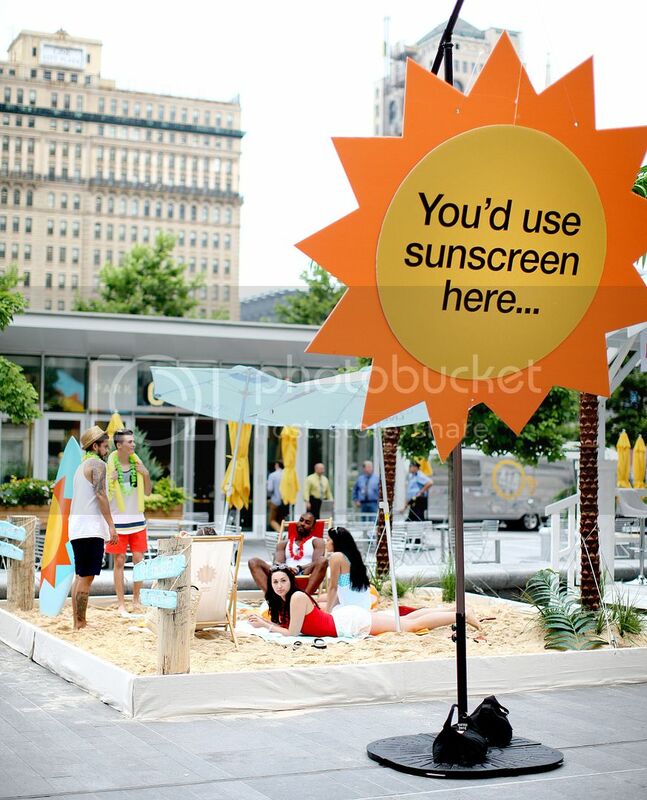 To increase awareness around the importance of skin health among occasional SPF users and encourage daily sunscreen use, NEUTROGENA® supported the Long Live Skin event on Thursday, June 23rd in Philadelphia, PA. The gorgeous model-actress Jamie King was on site at the event interacting with consumers and encouraging them and their families to wear sunscreen every day. 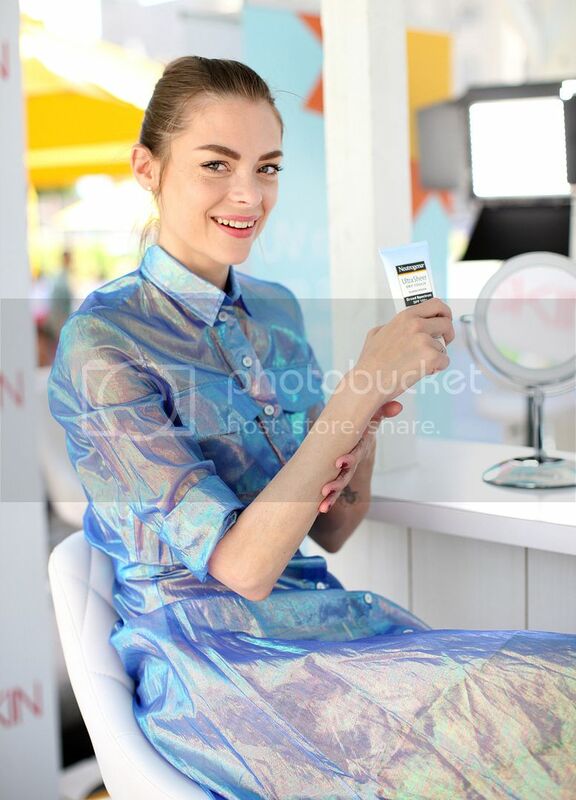 NEUTROGENA® Event Ambassador, Jamie King, helped to raise awareness of the need for sun protection reguardless of the season, weather, or geographical location. Jamie was on-stie to interact with customers during this fun beach-themed event. She emphasized the importance of protecting children from the dangers of the sun at a very young age. Sun protection is a very important topic to me. My life has personally been touched by the impact of inadequate sunscreen as I have lost a dear friend to Melanoma and my Dad constantly has Carcinomas removed. Daily sunscreen use is of the utmost importance to keep yourself protected! So, I am spreading the word on the importance of daily sunscreen use for ourselves, our loved ones, and our children. On average, more than 350 Americans are diagnosed with skin cancer every hour- even though skin cancer is one of the most preventable cancers. According to a study published in the Journal of the American Academy of Dermatology (JAAD), consumers often do not get the UV protection stated ont he sunscreen label because they grossly under-apply, using less than half the recommended amount. Just 1-2 severe sunburns can increase the risk of melanoma by 40%. Sun Safety Tips from Jamie King: Q & A with Jamie! Why is sun safety important to you? Sun safety was always ingrained in me. My mother was ahead of the game in sun protection and making us wear sunscreen at a time when there really wasn’t the awareness there is today. If we were in the sun, we were always protected. Skin cancer runs in my family, my father has it, so for me it’s something that is very important to me especially since it’s the most preventable form of cancer. Also, sunscreen also prevents fine lines, wrinkles and brown spots and keeps your skin looking great. How do you fit sunscreen into your beauty routine? People always ask me what my top beauty tips are and I always say sunscreen and water, so it’s easy to fit sunscreen into my beauty routine. Also, all of my makeup has sunscreen in it, but I always do double duty! You need to apply a sunscreen first and then apply your makeup with SPF. I apply sunscreen every day. People think if it’s cloudy out you don’t have to apply sunscreen, but that is just not true and when the biggest mistakes happen. I also apply it to my kids every day. The minute they get up before they put their clothes on, we put on sunscreen. It’s a routine, just like brushing their teeth. I also think it’s important to lead by example. Not only do they see me applying it on them, but they see me applying it to myself. NEUTROGENA® Ultra Sheer® Dry-Touch Sunscreen Broad Spectrum SPF 100+ is perfect! When you’re a mom, you are running around with your head cut off half the time. The product is so easy and weightless, so you won’t look crazy with white streaks running down your face and you’ll stay protected. It’s one less thing to worry about. What are your favorite NEUTROGENA® products for your kids? I love NEUTROGENA® Pure & Free® Baby sunscreen because it protects them from the sun without harsh chemicals and it doesn’t run and sting their eyes. What is your number one Sun Care Tip? Consistency and reapplying throughout the day! Especially with my kids, I like to reapply every 30 minutes and there are such great products available now that make it easy to do. How do you make applying sunscreen a fun activity for your kids? My son loves putting on his sunscreen, he puts it on himself. He uses the NEUTROGENA® sunscreen sticks and it’s like a fun painting project. First and fore most sunscreen – that’s a no brainer. I don’t carry much in my bag because I don’t love getting sand in it, but I always have books and headphones. I also always wear a hat and sunglasses to protect my scalp and behind my ears. Enter to win Neutrogena's Ultra Sheer® Dry-Touch Sunscreen Broad Spectrum SPF 100+. This sunscreen has the highest possible combined UVA/UVB protection. It is fast-absorbing, water-resistant, lightweight, non-whitening, and it has a nice fresh scent. Please enter using link/form below. 1 winner will receive 1 tube of Neutrogena's Ultra Sheer® Dry-Touch Sunscreen Broad Spectrum SPF 100+. Prize shipped directly to winner from Neutrogena. Pammy Blogs Beauty is not responsible for lot or damaged in mail giveaway items. Prize subject to availability. Giveaway void where prohibited. Must be 18 or older or have parents permission to enter. Duplicate or false entries will be disqualified. Neutrogena products are available at CVS/pharmacy. I always use a moisturizer or primer with SPF and then apply more sunscreen if I go to the pool or am going to be riding around in our Jeep. Wear a hat and reapply your sunscreen . Check the label for how often. You would be surprised at how short a time sunscreen lasts. Use sunscreen and stay in the shade as much as possible. A nice sun hat helps too. Wear hats and sunblock, sunglasses and drink a lot of fluids. I wear a sunhat and apply sunscreen religiously on myself, hubby, and the kids. I always wear a visor to protect my eyes and face from the sun plus lots of sunscreen. I also limit my time out in the sun. i always wear sunscreen, i use the neutrogena 100 face and have been for many yrs. i wear big sunglasses, a broad rimmed hat. when i mow, i use 2 hats, one to cover the front and another to cover the sides of my face. I always apply sunscreen, wear sunglasses, and wear makeup with SPF. I even have a lip balm with sunscreen!! I apply sunscreen on my face, neck, and hands daily, even if I'm not going out into the sun. If I'm going to be in the sun, then I reapply, wear a hat, and sunglasses. Be sure to remember to apply sunscreen to the tops of your ears, the part in your hair, and the top of your feet. I just try to stay out of it completely. I burn way too easy. So not the most adventurous way to spend days. But I can't handl the heat either. But when I do get out I use as much sunscreen as I can. I always wear SPF (even on cloudy days) and sunglasses! Wear sunglasses to prevent squinting and fine lines/crow's feet! Also wear a hat to protect your face, scalp and hair! I have the Neutrogena Ultra Sheer Dry-Touch Sunscreen SPF 55 and I use it daily, year round. 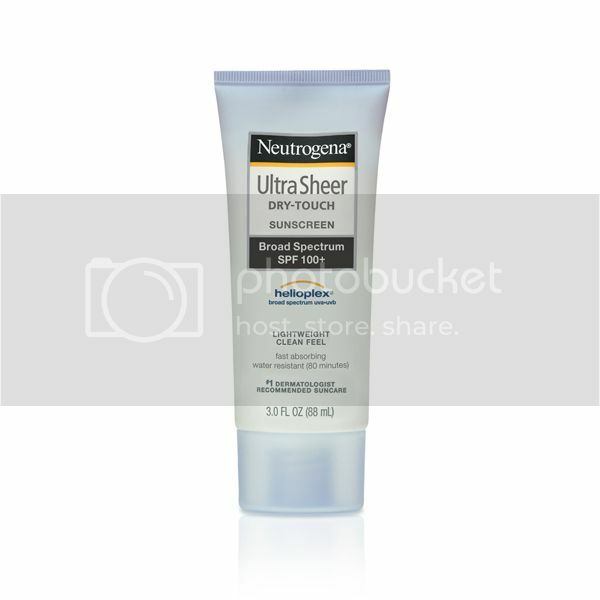 I would love to try the Neutrogena Ultra Sheer Dry-Touch Sunscreen SPF 100+. I've had skin Cancer so I wear lots of sunblock,hats and sunglasses to protect my eyes as well. I think it's pretty well known that we need protection from the sun, but I like to remind people that sunscreen works best when applied about 20 minutes before sun exposure. I put on my sunscreen/ moisturizer on first thing in the morning so I have time for it to work before leaving.